» Alb-Cor Bike Trail: Where to now? Alb-Cor Bike Trail: Where to now? Tom Denison on the phone on his farm. Well, “bogus” was the wrong word. I used it in a headline on my Jan. 16 commentary about objections by a dozen land owners to the proposed route of the Albany-Corvallis Bike Trail. Farmers along the route have concerns that are very real, as I learned Saturday in a visit with one of them. What about that long blackberry hedge between the railroad and his greenhouses — couldn’t the path go there? The berry bushes form a protective shield for his organic operation when the railroad comes through and sprays for weeds along the rail bed. So no, the brambles have to stay. What about traffic? I don’t see any this Saturday morning, but trucks routinely go to and from this farm on the end of Steele Avenue, and on other crossings to the grass seed operations to the north and south. And sometimes 18-wheelers come down Steele, rumbling over the tracks on a deeded crossing and immediately hitting the path if it’s there. 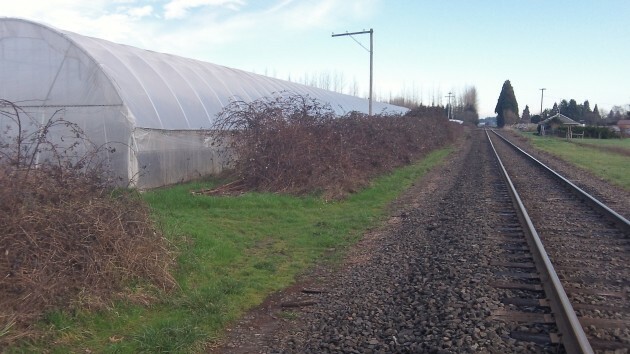 ODOT Rail has raised concerns about a path right next to railroad crossings. Indeed, half a mile away at Conifer, signs attempt to ban even walkers from crossing the street in a situation just like the ones to be created by the path. And even if that’s worked out and there are no collisions, whose liability insurance would rise just because now there’s the possibility of trouble when there wasn’t one before? I have scoffed at the farmers’ worries that a path in their back or front yards would lead to more vandalism and crime. Denison has an anecdote or two. Some kids came to steal strawberries; he talked to their leader and they’ve not come back. Another time, persons unknown had a drug party or something in one of his greenhouses. He found the trash they left behind, including a hypodermic jabbed into a tomato. He also reminds me that just last year some kids were goofing around on a Corvallis path and started a potentially disastrous brush fire. You’d think there would be room to squeeze in a bike trail, but apparently not. Taking the initiative to contact a farmer is commendable and should have been long ago. Two way communication is what is needed on ALL projects that could or would affect private parties. Often times all we hear from are those who feel they will derive the most benefit from a project regardless of how it may cause harm to others. Dear Hasso, Thank you for your post above and sort-of apology regarding the term “bogus.” I admit my hackles stood up when you said the farmers’ concerns were “bogus.” I considered your use of that term the most arrogant to ever come from your keyboard. I’m aware from reading your other opinions that arrogant is a word I would rarely ascribe to you. However, sometimes our personal wishes can overpower our reason, which in this case your desire for this bike trail I believe has done. I still say, how many people will use this trail, how much will it realistically cost, and would it be undertaken at all if people were asked to willingly pay for it? “I still say, how many people will use (fill in the blank), how much will it realistically cost, and would it be undertaken at all if people were asked to willingly pay for it? That’s true of about anything! Below is a link to a 2012 article mentioning a 2008 (+/-) estimate for the trail. The article describes the trail as being nearly 10 miles long, and the county engineer said that the 2008 estimate for the trail was ten million dollars, which translates to $1,000,000 per mile. Does anyone have a more current estimate? I must commend you for being willing to investigate the situation and change your view on the trail being constructed in this particular location. It is rare for people to alter their opinions after declaring them. It would be helpful if the policy makers could tour Dennison’s farm and see exactly what is at issue, too. Good job Hasso. Answers are not always easy. But, if the trail were constructed as described, the relocation costs of those green houses would absolutely be a part of the cost reimbursement appropriate to the landowner for the use of the property. Will that raise the cost of the trail? Sure! But that is a cost that I assume the vast majority of the trail supporters would support. There is an unwarranted, and unfounded, perception that when government seeks to use private property that they “steal” it from the property owner. Nothing can be further from the truth. Offers are made based on the “Fair Market Value” of the property. Improved, versus unimproved, property yield a higher value. 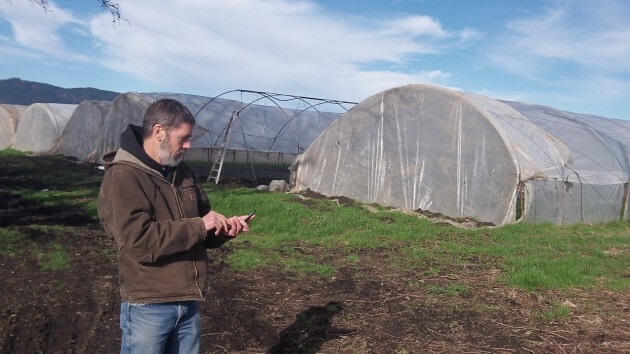 A farm is improved over raw unused land. The values of farm buildings is a further improvement, and yields a higher value. When an owner feels the value offered is not enough, they can negotiate for more. My experience with government staff in multiple jurisdictions, is that when a case can be REASONABLY made for a higher value they are quite willing to recommend\d that level. I emphasized REASONABLE because sometimes some folks demand an outrageous amount just to make a killing. I thinks most folks agree that when taxpayer money is being used, a reasonable payment is appropriate; a “killing” is not. If the case gets to the point of Eminent Domain being used, which is actually pretty rare, then the property owner can ask a judge to determine whether the settlement proposed is fair and reasonable. The judge has no position in the matter other that to make sure that the requirements of the law are followed and that neither the property owner nor the public is being treated unfairly. We all have emotional attachments to what we own, and when the government seeks property emotions can run high. Prior to the Constitution, property could be taken without any compensation, and was. The United States recognized that times occur when public use of private property was necessary, and enshrined in our Constitution explicit protection for the property owner. Of course the argument always swirls around what is a “necessary” use of property, and I’m sure it will continue to be a problem long into the future. That’s why it doesn’t happen very often, even when it’s a bike trail or public access to existing state park land. OK, maybe a small part of the land needed for this trail is covered by real objections. I hope the trail can somehow be saved and farmers with legitimare grievances can be accommodated. But almost all, if not all, of the objections to Benton County *keeping* (not obtaining by eminent domain) the Bailey Branch right of way south of Corvallis are bogus. Some farmers owning adjoining land (and their political supporters including commenters here) want the county to “immediately” sell the land to them “at cost” (probably below market value) thereby ***forever*** preventing a trail going through.